« The Green Ferrari: Italian Super-car Goes Electric! Solar Power Plane Preparing for Around the World Flight! The Solar Impulse solar powered plane has a wingspan of over 60 meters, close in size to that of a Boeing 747, but weighs about as much as a small car. About 12,000 solar cells cover the tops of the wings to generate power for the 40 hp engine, with an average speed of 70 kph (44 mph). 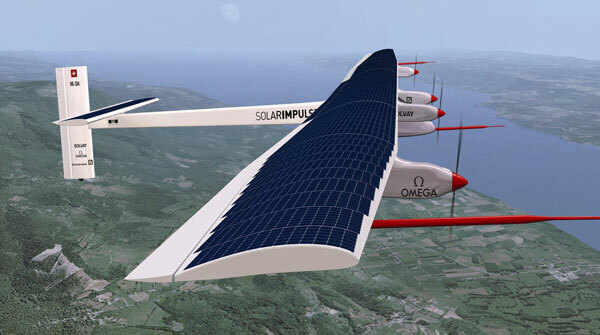 The solar powered aircraft conducted its first test flight in 2009 and in 2012 it successfully voyaged from Switzerland to Spain and Morocco. In 2013 the single seat plane traveled across the USA. The slightly larger design will circumnavigate the globe in the future. The duration is 20-25 total days up in the air with 5 planned stops to allow for changes of pilots. Each pilot goes through a 72 hour simulation in order to prepare their plane-and-pilot endurance of having to cross the Atlantic and Pacific Oceans. The initial date was set for 2014, but has been pushed to 2015 due to structural failure during static tests.